Sydney, Jan. 2 : South African cricket captain Graeme Smith has taken painkillers in an attempt to make the team for the third and final Test against Australia, which is being played at the Sydney Cricket Ground (SCG). According to team coach Mickey Arthur, Smith is keen to ensure a clean sweep of the series. Arthur said that he will be risking Smith, who requires revolutionary blood injections to treat a painful elbow injury, in a ruthless bid to record a clean sweep on Australian soil. Smith has been playing in "excruciating pain", sometimes unable to grip his bat, and will be sent home after the Test for treatment, missing the one-day international series and Twenty20 games. "He is desperate to play in the Test. He can start the game with pain and we can manage him through five days," the Herald Sun quoted Arthur, as saying. "He has four or five cortisone injections now," he said, adding "We thought that would work and it hasn''t and he has been getting through with a lot of pain. He goes through huge amounts of pain. But he is desperate to play in Sydney." "He wants to make this a really good Test match for South Africa. Then he will go home and get some rest," Arthur said. 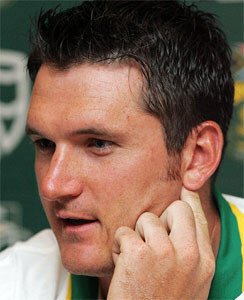 Smith will seek a surgeon in South Africa to give him blood injections which will stimulate repair and tissue growth. Playing Smith in a dead rubber is a clear indication of South Africa''s intent to go for the throat despite Arthur saying he felt for Australia. "We are not enjoying this. You don''t like to see any team copping what Australia are copping now. We have all been there. We were down that road a couple of years ago. We were in the same situation," Arthur said.